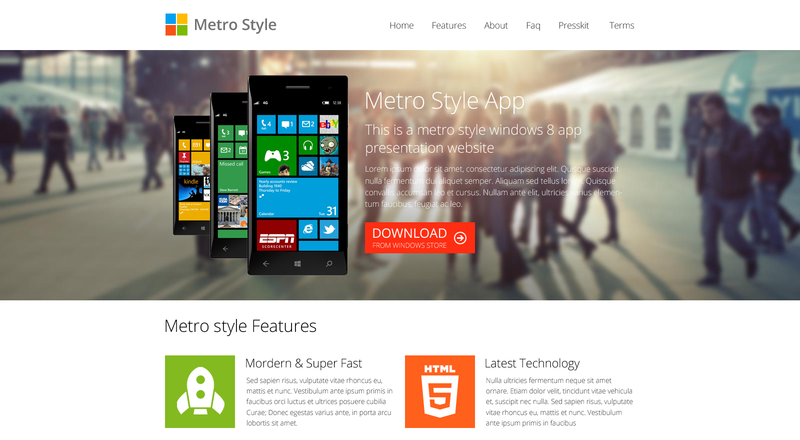 Metro Style is a Windows 8 App presentation Showcase Landing page website template exclusively for those making Windows 8 App. There are lot of App presentation for iPhone and android are available, but none of them suits Windows 8 app. So I created this template for those kind of people who were tired of searching Windows 8 App Website. This template is Clean, Modern, Metro Style Flat Design and fully responsive based on Bootstrap. Four pages Included in HTML and PSD. Also I have created downloadable Press kit, FAQ page, About & Our Team page, Terms page that are useful when releasing an App.